On June 18th, the Fort Worth Mayoral run off will be held between Betsy Price and Jim Lane. Through out the entire campaign, their respective signs stood along roadsides and street corners. Regardless of where they fall on the political spectrum, their signage is interesting as well as signage for the other candidates. Below are some thoughts on the designs of all 5 Fort Worth Mayoral candidates, in order of least to most popular vote percentage from the May 14th election. All images found via Google Image’s cache and copyright their respective owners. I have no affiliation with any candidate. All during the campaign, I never once saw this sign. I recall seeing a blue and white sign with some sort of stylized star, nor can I track down any images of the sign I’m thinking of. This design is high contrast sans serif type face, white against red. Zebrun and mayor are weighted, made bold, for impact and visibility. The drop shadow gives the type depth. Aside from the red and white contrast, nothing stands out, nor would I think this to be memorable. Again, we see the high contrast, eye catching red and white design. Barrett has several other things going on. His first name is skewed, albeit disproportionately to his last name. The last name, is skewed in such a way that it gives a sense of perspective–alluding to a path, or a way, or he has perspective on the issues? The skewing, renders the sign, “Dan B”. The tagline, “A New Way for Fort Worth”, is placed in the additional empty space, made by the distortion of his last name. Also, the alignment of the text needs work–Dan and Barrett should be better aligned, as does the tagline. Unless this sign is large, it’s not very readable. Cathy Hirt’s sign is visually interesting and appealing. Good typography–alignment and weighting of text, plus, the “for mayor” and the star flourish make this attractive. 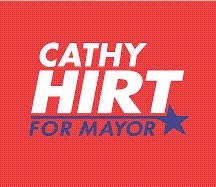 “Hirt” is dramatic and bold–definitely stands out, and the “for mayor” is interesting enough that the brain will make the connection. This sign will work for print and posters. Two concerns, however, are that the blue could be hard to read in passing or if the person was colorblind. Jim Lane’s sign is the first to break away from the red and white sans serif design. The other candidates up to this point emphasized their last names. Lane uses the brevity of his seven letters to an advantage–JIM LANE, in a distinctive typeface. 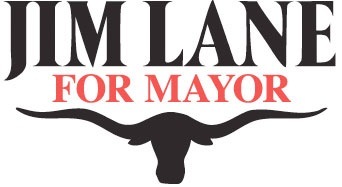 The “FOR MAYOR” contrasts well between his name and the longhorn. The longhorn. It’s very similar, if not the same as the City of Fort Worth’s logo, except in a different color. Does it help? Yes. Take it away, and the sign is generic. With the longhorn, it’s an image associated with anything Fort Worth–so much that it could easily blend in with all the other Fort Worth signage as Yet Another Fort Worth Sign. 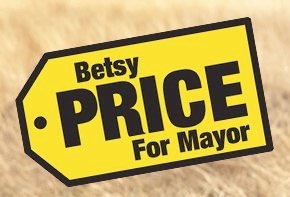 Betsy Price has luck from her namesake to help with a clever, interesting and playful design in that of a “Price” tag. The design is shaped uniquely with high contrast black sans serif text on a yellow background. It’ll work large and small. The similarity to the Best Buy logo is uncanny–and will definitely catch people’s attention. Price’s use of an already existing visual works, whereas Lane’s does not. High contrast, clean design, visually appealing and, if you can pull it off, add something unique. Plus, use the roadside test. Can you see, and remember, the sign in the brief moments someone may take to look at it? If you can only afford small signs, they better be clear and distinctive. Tina Fey brings clever wit and charm to her memoir, Bossypants that tells of her growth as a creative individual. This creative individual is also a confident woman, business woman, mother, daughter, wife, keen and self aware of the life she lives. All these roles culminate as she recounts the perfect storm of getting Oprah to shoot a scene for 30 Rock, play Sarah Palin for the first time on SNL and pull of her daughter’s third birthday, complete with pirate cake. The lessons she learned from her father, Lorne Michaels, traveling with Second City and running a neighborhood theater kept her together for those crucial few days. Bossypants brings a female perspective to the creative industry that reads well, and insightful. One interesting passage is her photoshoot for Bust magazine, and she expounds on her feelings towards Photoshop. Fey understands its purpose when used appropriately–enhance images for publication, and recognizes when it crosses the line to distort reality. It’s knowing those lines, where Fey excels at sharing in a self-deprecating style that makes they key part of an issue relevant. Collapse Into Now, seems to span soundscapes, melodies and riffs from their 30+ years. The lead song, Discoverer, the lead riff sounds similar to Finest Worksong. Oh My Heart‘s deep guitar strum is reminiscent of Drive. Every Day Is Yours To Win could fit into New Adventures in Hi-Fi, while That Someone Is You bounces around like Radio Free Europe from 1983. 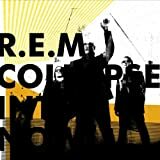 The songs are solid with Michael Stipe’s cryptic lyrics and steadfast delivery. Fast or slow, they remain true to their pop chorus verse chorus structure. Every Day Is Yours To Win feels shimmery with its simple melody and guitar. Closer, Blue, is the most unconventional with no real chorus and feedback laden outro. Arcade Fire closed their Coachella set with the anthemic “Wake Up,” adding some crowd interaction with a couple hundred glow in the dark, multi-colored beach balls. Swamplandia! feels like a collection of short writing exercises that were combined to form some sense of a novel. The prose is colorful, descriptive and imaginative, so much it reaches eccentric, teetering on contrived to tell a story of innocence lost. The Bigtree clan lives on an island within the Ten Thousand Islands, running a theme park, Swamplandia!, showcasing live alligator performances. Twelve year old Ava Bigtree narrates portions of the book with a voice reminiscent of Scout, from To Kill A Mockingbird. Ava tells of the death of her mother, Hilola, to cancer that causes the eventual breakdown of the family. Ava’s sixteen year old sister, Osceola, deals with the death inward, finding a book of spells and begins to date a ghost and takes off to marry the ghost in the Underworld. Her father, whom she calls Chief, operates in grand fashion and hyperbole as if everything is fine, disappearing to the mainland to seek investors. Ava’s older brother, Kiwi, aware of the family’s financial circumstances, leaves to get a job on the mainland at a rival theme park. About a third of the way through the book, Russell switches perspective from Ava’s innocent first person voice, to a third person observer of Kiwi’s work at the World of Darkness. The novel then jumps back and forth between Ava and Kiwi, where Ava’s story descends into uncomfortable horror with a figure named Bird Man and Kiwi’s ascends unbelievably to becoming a pilot for a theme park attraction. Both lose their innocence of the world both emotionally, intellectually and physically. Russell employs symbolism to some effect. Ava hatches a lone alligator, born scarlet red, that plays a crucial role with Bird Man and her own innocence. Osceola’s descent into depression is the Underworld, and The World of Darkness is Kiwi’s lack of knowledge. All this builds to an unbelievable convergence of plot lines that ties up too well. Throughout, as a reader, you can’t help but know things that the characters don’t. At times this is clever, at times it feels cruel. Swamplandia! is an enjoyable read if you’re comfortable with a high wire act of colorful prose and gothic eccentricity. Spiral delivers a smart and tense techno-thriller. Liam Connor, an Irish soldier who was a scientist during World War II, witnessed a horrific event in the Pacific Ocean, where the military took extreme measures to end a biological outbreak caused by the discovery of a lone Japanese sub whose crew died of mysterious reasons. Sixty four years later, Connor, an accomplished professor at Cornell University, is found dead of an apparent suicide. Survived by his granddaughter Maggie, grandson Dylan and close colleague Jake Sterling, Liam leaves a series of clues, knowing something might happen to him. A brutal killer follows them, in search of what Liam knew of the incident in the Pacific. Meanwhile, Robert Dunne, a national security advisor hears of Connor’s death and immediately knows what his death is related to. Spiral’s plot is well paced with a rising sense of tension. Seemingly random details tie in well throughout the book, and the interactions between characters and the characterization of the main characters is well done. Perhaps there isn’t nuance, but there is depth to Jake, Maggie and Robert and even a villain. McCuen isn’t afraid to kill off secondary characters in gory deaths, either, and surprisingly, the dialogue, for a debut novel in the thriller genre, flows well. Underlying the plot, themes of political paranoia, xenophobia and the responsibility that comes with modern science come out. Mostly sounds like garage rock with some bluesy riffs. Not too many punk chord progressions. Some songs go on too long, with half the tracks clocking in over 4 minutes, and 4 songs head over the 5 minute mark. 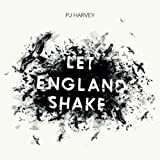 PJ Harvey’s Let England Shake contains numerous songs, full of atmosphere and reverb. Some vocals don’t seem to make it through all the layers of production. The only standout track, to me, is On Battleship Hill, but only because it feels tribal, like something Enya would do. Not really impressed with this album. 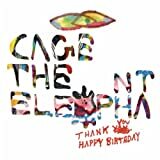 Cage the Elephant’s Thank You Happy Birthday takes you on a roller coaster ride through an amalgam of 90s rock. In the layers of drums, guitars, bass and slightly nasal vocals, you’ll hear influences of the Pixies who experimented with sonic textures; effect laden guitars, ala Smashing Pumpkins; simple chord structures in the vein of Blink 182; lyrics that resemble Oasis penchant for imagery. 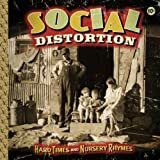 Always Something leads the album off with a slightly electronica track with a cynical take on modern life–catching your girl with another guy, violence against a homeless guy. Modern stuff. Aberdeen has the first catchy hook on the disc as it builds into a shout about a girl. Indy Kidz is driven by frenetic vocals and sawing guitars with the song building to a Rage Against the Machine like spoken word outtro. Shake Me Down seems to be the lone misfire on the album with no memorable hook. 2024 feels like something Blink 182 would do if they were serious about life. Sell Yourself is an angry more primal, cynical commentary on people selling themselves for a quick buck. Then the album drops in tempo to a warbling ballad, Rubber Ball about trying hard to do good things. With Right Before My Eyes, Around My Head, Japanese Buffalo and Flow… you’re in the final stretch of the ride, where each song will remind you of something you’ve heard before. Lastly, after the closing track, the band offers a more down beat take on Right Before My Eyes, where the slower, ballad like tempo fit the lyrics better.